Gross Weight (GVWR) 6250 lbs. 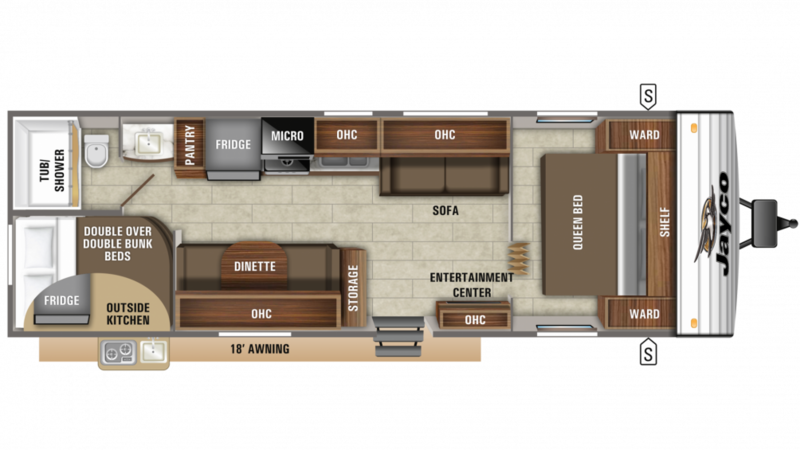 Experience the camping trip of a lifetime in the 2020 Jayco Jay Flight SLX 298BH! This Travel Trailer is ready to go on the road! You'll find incredibly low prices and a huge inventory of all the top brands here at Tradewinds RV Center, one of the top RV dealers in Michigan! Whether you live nearby or are just driving through Clio, stop into our lot at 4325 W Vienna Rd Clio Michigan 48420 to find your next RV! With our great deals and easy financing, you'll save $1000s! If you have any questions on this Travel Trailer, call us at 810-686-0710! Our friendly, knowledgeable sales staff will show you how you can own your dream RV at a dream price! And with our fast, reliable 24/7 delivery anywhere in North America, it'll be at your door in no time! The 18' 0" awning is easy to pull out and provides extra shade and protection outside! With a manageable hitch weight of 555 lbs. and GVWR of 6250 lbs, you can go on long-distance trips without out any issues! You'll get a great night's sleep in the cozy, comfy bedroom in this Travel Trailer! It's roomy and private, and you'll relish snuggling into the regal Queen bed at the end of the day! Up to 8 people can find refuge in this RV at night! Whip up delicious meals whenever you please in the kitchen! It features great amenities for easy cooking, including the 6.00 cu. ft. refrigerator and the 3 burner range cooktop! Before you leave home, make sure to fill up the 42 gallon freshwater tank for loads of clean water to drink, wash, and cook with during your trip! While you drift off to sleep in the master bedroom, your kids will be just as comfortable in the bunkhouse with its cozy Bunkbeds! Food cooked outdoors always tastes great, doesn't it? You'll be able to whip up great meals outside thanks to the convenient, easy to open outdoor kitchen!